I have not blogged much about the visual art I enjoy creating. For this first month of 2017, I thought I would start out the year by posting one of my favorite projects–I call them “Heartfelt Tokens” because these small tags are personal one-of-a-kind collages that are really creatively satisfying to make and fun to give as gifts. If you are intrigued, and think you might also enjoy making them for your friends, family, and unexpectedly kind “strangers”, instructions and supplies are listed below. In general, I find it very relaxing and meditative to create collages of all sizes. In the future I hope to write more about some of the creativity classes I used to teach that made use of this accessible art form. It’s great to have tokens already prepared for quick gift giving or timely thank you. I like to take them on trips because they fit easily in my carry-on and are a personal way to acknowledge a unexpected birthday or other occasion, or to thank someone for a kindness. 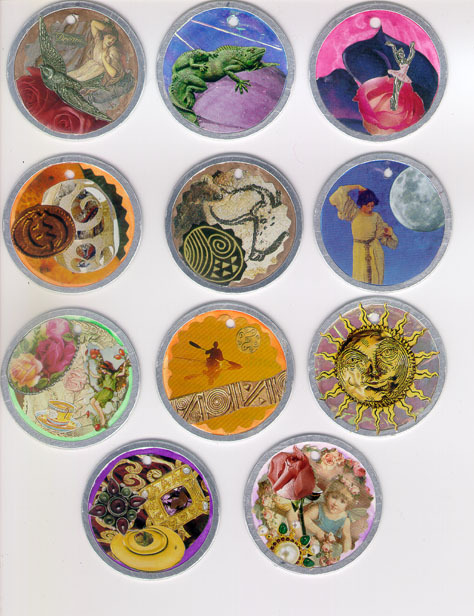 Speaking as a “teacher”, with a little advance planning, these tokens are an excellent activity for any group of artists ages 5 and up. Parents might also consider making these with their children for “Teacher Appreciation Day”. 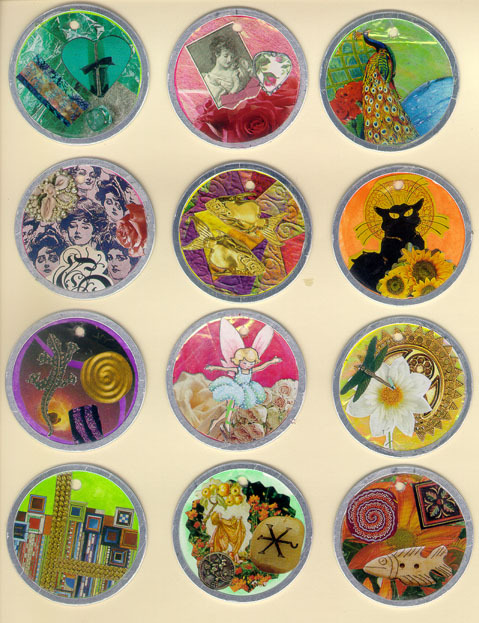 I don’t have photos of all the tokens I have made over the years, but I recently found these photos of tokens I made in the 20th century (smile). Other optional items: Small alphabet rubber-stamps with ink pads; Post-It repositionable glue, labels for laser or inkjet printer; beads, sequins, charms, buttons, etc. If you are going to be using some really nice ribbon, remove the white string from the tag. If you are making these with children, and/or you are going to hang the tags to dry, you may want to just leave it attached, your decision when, or if, to remove it. Base coat the front and back of the tag with the watercolor of your choice and let dry completely. On back of tag (where the metal rim is slightly thinner and a bit wrinkled) write or rubber-stamp the word “TOKEN” and sign your name. I think it is better to do this BEFORE you add a collage to the front so that the stamping is done on a flat surface, and your collage will not get damaged. TIP: I’ve found it helpful to make a circular cardboard template (slightly smaller than the inside diameter of the front metal ring) to use as a cutting guide for background pieces. If you have a stick of PostIt re-positionable glue it works great to hold the template in place while you cut. On the front of the tag, arrange flat decorative elements like stickers, images cut from magazines, uplifting words, and patterned or textured papers. When you are satisfied with the arrangement, glue all the elements in place. TIP: I like to lay all my painted tags face up on a table while I search through my collection of small precut magazine images and words. I find one major background paper or image for each tag, and then I pull out at least 2 or 3 interesting elements/images to create the “token”. I try to tell a little story or to create visual color-texture experience. I then arrange these elements and trim as needed before gluing down. GENERAL TIP: If you decide to make a large number of tokens at the same time, consider planning this project in stages over 2-5 days. Paint one day, choose a major background elements the second day and glue them down, cut out images a little each day (until your hand is sore–you should stop then *smile*); lay your tokens out select images on the third and fourth day, attach ribbons and complete cards on the fifth. MOST of the time, I do not attach any dedication (or token designation stickers- -thanks, love, best wishes, etc.) until I actually know who the token is going to, this way I can choose the appropriate image and inscription, but you can do whatever you like! If the hole in the tag has been covered by paper or images, re-punch, stab with a darning needle, or otherwise open it again now. Cut a 5”- 6” piece of coordinating ribbon. With the front of the tag facing you, fold the ribbon in half and push the folded end partially through the hole in the tag. When a ribbon loop is seen through the back of the tag, slip the other free ends of the ribbon through the loop and pull them to from a slip knot. Your TOKEN is now ready to give or use as an ornament. If you have chosen to punch 2 holes, feed each ribbon end through one hole to the back of the card. Cross the ends in the back and feed the ends through to the front of the card and tie in a bow to secure. If you have 4 holes, feed the ribbon ends through the two middle holes then back through the two outer holes, tie in a bow to secure. Holding a 3”x5” card with the 3” side on top, make 2 or 4 holes near the top of the card (see picture). Remember to sign your name on the card and put it into a clear or coordinating envelope to keep it clean and undamaged until you present it. A special day or event in your life; a photo montage of the important people in your life–using color copies not the actual photos; colors and words to inspire you; as a gift for a friend select images that relate to that person or words and images of things you’ve done together; baby shower, birthday, or wedding gift–images, colors and words that correspond with the event. Working with kids: Small children can make simple tokens using crayons and stickers to give to their parents or other honored member of the community. Using the tags original white string – tape string to index cards preprinted with a dedication and optionally, insert into envelope. 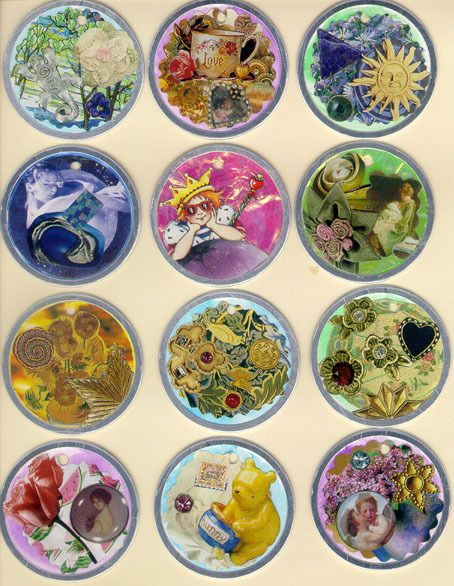 Kit idea: (Great for teens) Make a kit so your favorite creative friend can make their own mini tokens. In a ziplock bag place: 5-10 blank tags (with strings removed); an equal number of 5”-6” lengths of white ribbon; a selection of stickers; a small glue stick; a small box of colored pencils; index cards with holes pre-punched; sheet of self-adhesive labels with a selection of dedications (You can make these at Hallmark stores on machines they have there – you will have to choose one saying though so pick something general like “A Token of My Best Wishes.”); and print out the preparation and presentation instructions I’ve written above. This idea is ©1999-2017 Laurie Early. Please feel free to create these tokens for yourself or as a fund-raising/community project, but please do not market or sell them commercially (for example, in retail stores) without my prior permission. are personal & such a loving gesture. in the boat! Peaceful & I love solitude..
you are. You should give workshops! Next PostLet It Rain !